Whether it is the stranding of tens of thousands of migrant workers at the Libyan–Tunisian border, or the large-scale displacement triggered by floods in Pakistan and Colombia, hardly a week goes by in which humanitarian crises have not precipitated human movement. While some people move internally, others internationally, some temporarily and others permanently, there are also those who become "trapped" in place, unable to move to greater safety. Responses to these "crisis migrations" are varied and inadequate. Only a fraction of "crisis migrants" are protected by existing international, regional or national law. Even where law exists, practice does not necessarily guarantee safety and security for those who are forced to move or remain trapped. Improvements are desperately needed to ensure more consistent and effective responses. 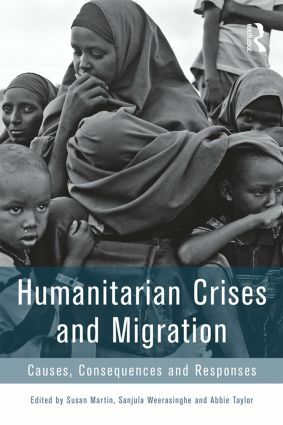 This timely book brings together leading experts from multi-disciplinary backgrounds to reflect on diverse humanitarian crises and to shed light on a series of exploratory questions: In what ways do people move in the face of crisis situations? Why do some people move, while others do not? Where do people move? When do people move, and for how long? What are the challenges and opportunities in providing protection to crisis migrants? How might we formulate appropriate responses and sustainable solutions, and upon what factors should these depend? This volume is divided into four parts, with an introductory section outlining the parameters of "crisis migration," conceptualizing the term and evaluating its utility. This section also explores the legal, policy and institutional architecture upon which current responses are based. Part II presents a diverse set of case studies, from the earthquake in Haiti and the widespread violence in Mexico, to the ongoing exodus from Somalia, and environmental degradation in Alaska and the Carteret Islands, among others. Part III focuses on populations that may be at particular risk, including non-citizens, migrants at sea, those displaced to urban areas, and trapped populations. The concluding section maps the global governance of crisis migration and highlights gaps in current provisions for crisis-related movement across multiple levels. This valuable book brings together previously diffuse research and policy issues under the analytical umbrella of "crisis migration." It lays the foundations for assessing and addressing real challenges to the status quo, and will be of interest to scholars, policy makers, and practitioners committed to seeking out improved responses and ensuring the dignity and safety of millions who move in the context of humanitarian crises.